Super Panavision 70. Restored version. Shown generally i 70mm magnetic and in 35mm DTS and Dolby Digital. 70mm DTS was test. Anamorphic. The 70mm print was shown two days and returned to Lucas Film. Anamorphic. Nobody does it better in 70mm DTS! 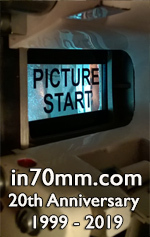 Video to 70mm. Public performance not known. Pearl Harbour 21.06.2001 Siebu Dome outside Tokyo, Japan Just one 70mm print, one performance and a DP75 in 8 (eight) channel 70mm DTS. Play Time 19.05.2002 Palais de Festival, Cannes, France Released theatrically July 3, 2002. A Year Along the Abandoned Road 2003 - New 2003 70mm prints of the 1989 title. Lab: Gullivier, France.